IHeart Organizing: Happy 4th, a Silhouette Promo & a GIVEAWAY! 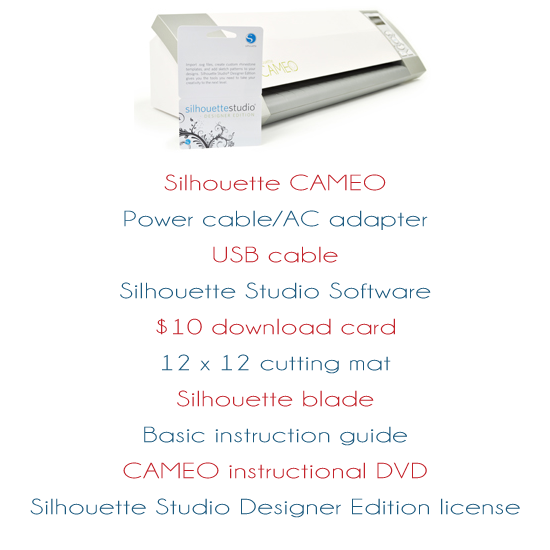 1111 Happy 4th, a Silhouette Promo & a GIVEAWAY! I am taking the day off to spend time with my sweet little P's, however, I wanted to pop in to wish you all a happy and safe holiday, and say a huge THANK YOU to all that serve our country each and every day! I am also excited to let everyone know that it is Silhouette Promo time! Promotion runs from now through July 11th, 2012. More good news for ya! I get to give one of these awesome bundles away to one lucky IHeart Organizing reader! Happy 4th and good luck everyone! what an awesome giveaway! I would definitely use it to make labels to organize the toy room! I would decorate my son's bedroom walls! Labels for my kid's toys! I'd make these cute silhouettes of my girls in frames for my parents who are moving away and as ornaments for their great-grandparents. Oh the endless possibilities of things i could put vinyl labels on....Love when you have these giveaways!!!! I definitely need one of these! Thanks for the giveaway! I love crafting and I see so many great projects using a Cameo - I would LOVE to have one for so many reasons. I just can't afford one right now, even with such a great promo price. Thanks for the giveaway opportunity! I am just dying for my own Cameo, but on a teacher's salary I just keep crossing my fingers to win one in a giveaway! Hopefully I will win one soon so I can make labels for my pantry overhaul! Thanks for sponsering my dream giveaway - fingers crossed! I've been wanting a silhoutte cameo for quite a while. Would love to win one! My first project will be a little plaque to put in the laundry room that reads: "Sorting out Life: one load at a time"
OH MIGHTY CRAFT GODS! LET ME WIN!!!! I think my first project would be something for my new classroom! First project? Vinyl welcome sign for front door. I would use it to label everything!! First project would definitely be labeling. What would I label? Uhm, everything! My first project would be the boys room...making some signs for their toy baskets. I would make labels for my laundry room! I would make labels for the little girls. I would loooove to win a Cameo! Every time I see a blog post on a Silhouette project, I dream up projects of my own. Labels in my kitchen, sewing room and bookshelves would be my first. Thanks for the giveaway! Wall art...I need large wall art!!! I'd make labels for everything: garage, office closet, pantry, linen closet, clothes storage, etc. I just got hired for my first teaching job (woohoo!) so I would use the cameo to make fun labels and decals in my classroom! Where would I start?? Probably something fun for my daughters room. I would use it to get my daughter ready for Grade One - labels for her books, lunch tags, etc. i think i would definitely start out with labels & tags. thanks for the giveaway! would love to try this - I can think of about 100 uses!! If I won I would give this to my Granny who is a scrapbooking ninja! I hope she'd let me borrow it from time to time though! I would etch my pyrex first thing then start with some vinyl for my laundry room after the pedestals are built! :) Thanks!! I would start with my pantry, organize & label everything!! Would LOVE to use this for our move!!! LOVE your blog!!! The first project I'd make is 2 cute tees for my 2 girls! Hoping I can win it! I would love yo be able to make labels around the house and use it for my passion as well.... Card making! I would make better labels for my new pantry organization baskets. Right now I just have white paper with typed words and laminated. I'd make some fun tshirts for my son. I would so love to have a Silhouette. So much fun it would be. Definitely would like to have some vinyl artwork & words in my kitchen & bath. I'd also like to use it for glass etching, cardmaking, scrapbooking and for applique' embellishment on clothing and quilting. I have a huge project list of ideas! The first thing Id make are cute signs for my sons upcoming birthday party. Thanks for the opportunity. I would love a silhouette cameo! I would use it to label everything... Especially the pantry! I would probably start work on my son's NICU scrapbook... and make some cool stuff for my scraproom/office. Oh my gosh, I NEED THIS! I can't even imagine all the things I would use it for. Making labels in the pantry, decorations for my two month old's nursery and finally getting to organize it properly, the list goes on and on! My first project would either be craft room or kitchen labels. I want to make my son a sign for his room with a line out of one of his books about trucks! I would make some onesies! Oh, wow - I would make labels for all the Godly Play baskets in the two classrooms at church. I've been waiting for a creative way to do that! To start.... Chalk labels for my jars on my counter. After that, the ideas I pinned on pinterest! Would love to win. I'd share with my mom and daughter. My mom just can't do the things she used to be able to do by hand. My daughter has so many amazing ideas for her room. I'd share with my sister, mom and mother in law. We all love to craft and would get such good use out of this. Thanks for the chance to win! I would label everything in my house! My First project: LABELING everything around the house!! I'd love to win this. My two teens and I would love to create with it. I have so many organizing ideas. I would put the finishing touches on my laundry room/mudroom! oh, it would be a label-oh-rama around here. i'm thinking the pantry first. Labels, labels and more labels! I STILL want to download cute birds and cut them out of vinyl and put them on the baseboards, door frames, and window sills of my home. They would make me smile everytime I walked by. I'd love to make things for my daughter's room! I would make chalkboard labels for the containers in our pantry. I would put my daughter's name on her pottery barn knock off toy chest! I would love to label everything in my pantry! Label my spice jars...finally! They've been sitting there waiting for me forever! I would make decor for my classroom. I have a new Elfa pantry that is definitely needing labels on all of the glass containers! My first project would be some vinyl decal labels for the ceramic jars in my kitchen. I love how vinyl works well on fabric. I would label all my fabric bins. I also would live to make a fabric quiet book. The cutest ones I've seen use the cameo. I would love to decorate my kitchen appliances with beautiful vinyl decals. I have so many things I want to use this for. I would label the bins in my little boy's room in a super cute font. I've been wanting a cameo! I need to make lots of pretty labels! My entire house is in desperate need of labels on storage. Thanks for the chance to win! I really want to make some custom t shirts and onesies! I want to make custom shirts for my girls and a million different vinyls! I would love to use this to make some cute art for my home! I'd use this to make cards and scrapbook layouts. I totally would make labels for my re-organized kitchen and pantry containers! I would use it to make fabulous labels for my newly remodeled craft/storage closet!! Ooooohhh, it makes me want it so bad!!! labels, labels and more labels. i love labels! I would make stuff to decorate my classroom. I would make fun labels for all my jars in my kitchen! I would make labels for all the areas of the house I have reorganized thanks to your great ideas! I would label my toy storage bins! I'm getting married in December and would love to be able to do some DIY projects. This would be so helpful! I would use it to get my Craft space organized, but really I have all sorts of projects. I would use it to label things for my upcoming wedding..... Also I would use it to label everything in my house!!!! I would love to use it on creating bright and fun labels for the new containers in my kitchen! Jen, you rock! Absolutely the best giveaways! Thank you and can't wait to start my labeling projects. I love your blog! And I super need a Silhouette! I would love to make labels and organize my craft room, finally.Thanks for the chance. Labels for my pantry. I'd love everything to be labeled and organized. I would love to be creative for our upcoming first trip to Disney World. Sweet giveaway! The first thing I would make is new library bags for the kids, cut a shape/silhouette/letters of their choice and use as a stencil. I would use a Cameo to make tons and tons of labels for all of our stuff! We're mid-move, and I keep thinking, "If only these things were labeled..."
I would LOVE this for all my crafty projects, but I can totally see it being used for fun decor projects! I have a sign I want to make! I would etch out stencil decals to place upon my electronics and things like that. Wow, awesome giveaway. Thanks for the opportunity. I have really been wanting to try an electronic cutter (I have a Big Kick), and this would be perfect!! Definately to organize my pantry and homeschool supplies! I think it would live on my kitchen counter being used so often! I would love one to finish all the DIY crafts in our nursery-in-progress! I think my first project would be decorating my laptop and e-reader! Oh the things I could make.....what a great giveaway! I would love one of these! With 4 kids, we could use a lot more labeling around here!! I would make some vinyl words for my living room photo wall. I'd make labels for the jars in my pantry! I would love to try making vinyl wall decals. I would make floral decals to put on my oak entertainment center. homeschooling 5 kiddos, there would be tons of labeling to be done....would love to put their names on their doors & i love the wooden spoon garden stakes. I would definitely decorate some jars to organize my new pantry since we just remodeled our kitchen!! I would use it to make labels for my sons new toy bins! My son is having a birthday and I would love to have one to make Decorations and labels! I would stencil a skirt. I would like to make a 'skin' for my laptop or some vinyl signs for decorations, etc. Hope I win, I have so man ideas! I'd like to do up some vinyl lettering for my daughters room. I was just painting onesies using contact paper as a stencil and thinking how nice and quick it would be if I had a silhouette machine! I would use it to journal the vacation that we just returned from! I would create beautiful greeting cards! i would use it for labels in my pantry and office. I still want to make the yellow flower they had for a long time in their promo pics, I'd make a whole bunch of them. Then I'd move on to backgrounds for labels for EVERYTHING and then I'd move on to vinyl for our walls, a phrase in the bathroom probably first, then my girls room. I would start by making a bunch of labels to help me get my house organized! I have no idea what I would make first. I have a list of projects already! I would get some heat transfer vinyl and make my kiddos some awesome personalized shirts! I would definitely add some inspirational words to our bedroom walls! I would make letter stickers for my awesome Target flatware caddy! This would be fantastic...I have been had cutting stencils ...aargh I etch on pyrex for family and friends. I have been thinking of expanding and selling them at fairs. This would make to so much easier and look much better! Thank you for the opportunity to win one of these fantastic tools! I'd love to try something with fabric ink. Probably a stencil for some summertime t-shirts for the kiddos! I want a Silhouette so badly!! Sewing projects, vinyl on everything... I'd go crazy with one! I've been wanting one for sooooo long! So many projects I have in mind! I would be blessed to win the Silhouette. I'm starting to design our playroom, and this would be such a huge help in getting organized. After the playroom is finished, the office will follow. Thank you for offering such a great opportunity, and for creating such a wonderful blog. I would add vinyl cut letters of my last name to an old window to use as wall decoration. I would organize my pantry! My first project will be labeling bins!! I love wood boards that have sayings on them. I have been wanting to make my husband one that says "you are the ___ to my ...." That would be the first of many tings! My first project: a vinyl decal for the tub in my new apartment that says "get naked"
Then I'd make some custom onezies for friends' babies! I would make labels for organization tubs! Hoping to make a cute set of frames for my niece's nursery! I would finish my pantry redo with some pretty labels ! A Silhouette would really help organize our kid areas! Labels for the kids toy area!